HCTF Silver Award winner Lee Wiliston’s project was recently featured in the 2016 Cariboo-Chilcotin Fishing Guide. Angie Mindus, editor of the Williams Lake Tribune, wrote the following article about the Quesnel Lake tagging program, and has kindly agreed to let us republish the story here. A five-year study examining the effects of angling pressures on resident rainbow, bull and lake trout in Quesnel Lake has netted a prestigious provincial award, accolades from professionals in the field and critical information to ensure the long-term survival of the species. The Quesnel Lake fish tagging program, which was launched in 2013 in response to public reports of improved fish numbers in the lake and requests to review the restricted fishing regulations, is entering its fourth year and relies on a winning combination of a high tech fish-tracking system and good oldfashioned reporting from anglers. Lee Williston, study leader and senior fisheries biologist with the Ministry of Forests, Lands and Natural Resource Operations, said he couldn’t be happier with the results. The study has shed some light on critical questions surrounding the different species, such as the species’ mortality rates, use of habitat and sensitivity to angling pressures. To date, about 600 rainbow, bull and lake trout have been equipped with high-reward floy tags and released back into the lake where Williston’s team have placed 30 acoustic receivers at various locations in the 100 kilometre-long, 525-metre deep lake. Of those fish, 250 have also been implanted with acoustic tags. When an acoustic tagged fish travels within approximately 700 metres of a receiver, the unique identification number, date, time, location and depth of the fish is recorded. “The technology available is incredible,” he said. The method has revealed some fascinating preliminary data about the genetically unique rainbows, which are the main focus of the study, confirming that the fish will travel from the tip of the west arm at Likely to the end of the east arm in as fast as a week searching for food. It has also confirmed what area residents were reporting – that the large, genetically unique Quesnel Lake rainbows were making a comeback. “For the most part, things look really positive. The size and condition of the rainbows has been very good. 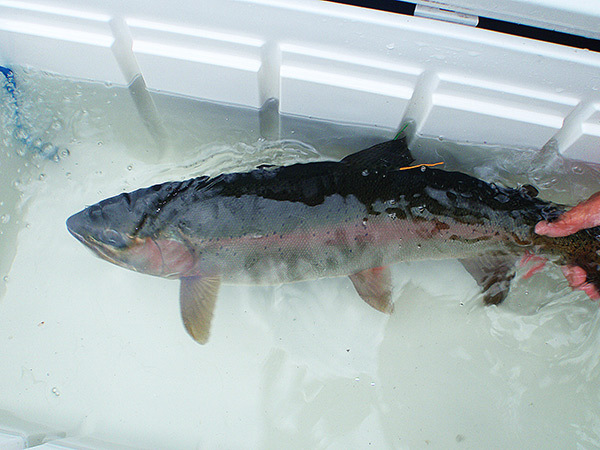 Their numbers have also improved in recent years, largely due to the increase of Kokanee, their main food source. But more study is needed to fully understand the exploitation rate of rainbows,” Williston said. With help from members of the fishing community, who have returned 50 $110 tags on rainbows so far, Williston said they suspect the large rainbows are sensitive to overfishing, due to their aggressive nature. Early study results from lake trout, on the other hand, led to the ministry increasing the daily quota of Quesnel Lake lake trout from one to three per day, after it revealed the species has a low exploitation rate. The study is also providing some information on the lesser known, more illusive bull trout. Williston said the bull trout, which are strictly a catch and release fishery on Quesnel Lake, are a sensitive, cold water fish that require steep, cool streams to live in for the first one to three years of its life. He said the bull trout seem be closely linked to the salmon as a critical food source and have limited habitat in Quesnel Lake, which naturally limits their numbers. He noted few systems have rainbow, bull trout and lake trout co-existing. “They’ve carved out at niche at Quesnel Lake.” Williston said angler participation has been essential to the success of the program, set to wrap up next year, and determines critical estimates on exploitation rates which in turn will help set regulations. The Quesnel Lake Tagging Program was made possible through funding provided by the Habitat Conservation Trust Fund (HCTF), which is largely supported by licensing fees collected from anglers, trappers, hunters and guide outfitters. This year HCTF recognized Williston and his team with its prestigious Silver Award for outstanding contribution to conservation in B.C. HCTF CEO Brian Springinotic said Williston’s proposal, which beat out 200 other applicants, was well thought out with clearly stated objectives that included community involvement. “He’s done a great job in reaching out to the community to explain what work is being done out there and that’s really important. People want to know what is happening in their areas. They are genuinely interested in the study and the resource,” Springinotic said, noting HCTF recognized the project’s value early on.